As both teams started poorly in their opening games before finding their rhythm after some smart substitutions, you would have expected improved performances in the second game, but it wasn’t to be. Belgium went with a side largely resembling the one that came back in the second half against Algeria, Dried Mertens and Marouane Fellaini taking the place of Nacer Chadli and Moussa Dembele, while the more attacking Thomas Vermaelen replaced Jan Vertonghen at left-back, only for them to switch back again in the first half when Vermaelen was injured. Russia largely continued with the workman-like side that started against South Korea, Andrey Eshchenko and Yury Zhirkov replaced by Alexey Kozlov and Maksim Kanunnikov. 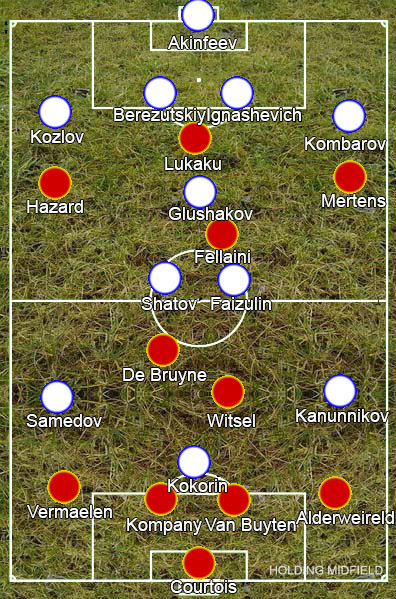 Their formations mirrored one another – Belgium in a 4-2-3-1 and Russia in a 4-3-3 – and the midfield each picked up a man and kept very close to them, ensuring their was little space in the middle. Russia were more energetic than they had been against South Korea, but, although well-organised, the majority of the chosen players are mediocre at best and offer little going forward. Fellaini worked against Algeria because they sat so deep, his height became a major goalscoring asset, but here his weaknesses were exposed. He stands out as a quality player in teams not looking to dominate, yet in a top team his awkwardness becomes a glaring issue. He isn’t mobile enough and Romelu Lukaku was also static ahead of him, having another excruciating game leading the line at the World Cup – only Mertens on the right provided any sort of movement or creative spark as Belgium’s attack was silenced. The game was crying out for one of Aleksandr Kerzhakov or Alan Dzagoev. Aleksandr Kokorin had looked much brighter on the wing in the opening game and Kerzhakov’s movement would have created far greater problems for the Belgian defence. Dzagoev had completely changed the game around against South Korea and given Belgium’s full-backs don’t get forward much, playing him in a wide area where he could drift inside and outnumber the Belgians in the middle was an obvious way for Russia to get the upper hand with little risk, yet he didn’t come on until the 83rd minute. With South Korea and Belgium playing each other in the final game, Capello’s idea was presumably to beat Algeria in the final game and scrape through on five points. We should be thankful for Divock Origi’s late goal however, as it means the Russians may be punished for fielding a team that resembles a lower midtable side rather than play their most talented players.